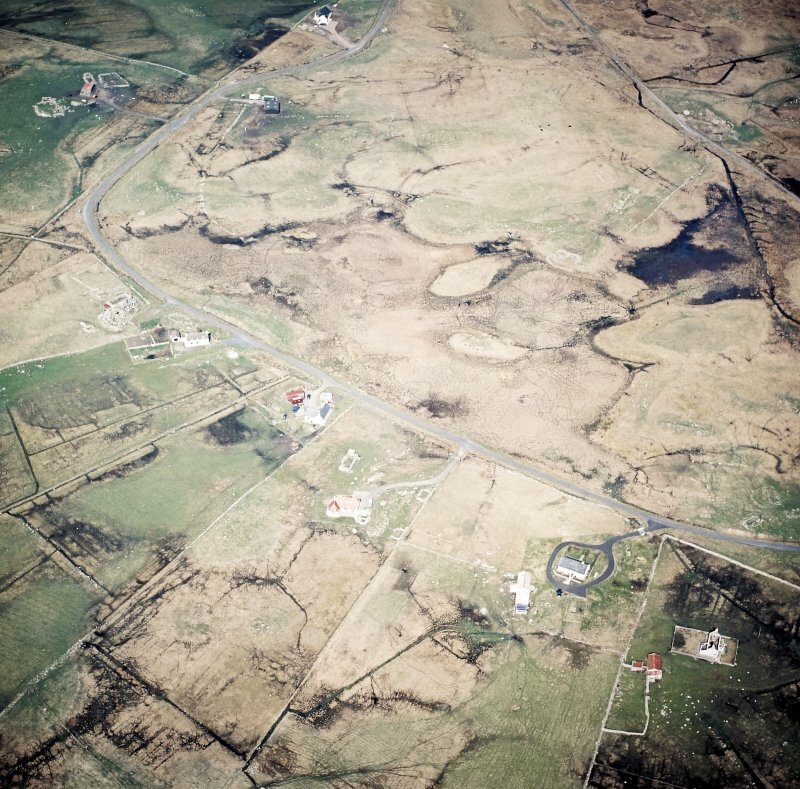 Oblique aerial view centred on the crofting township and the remains of the buildings, taken from the SW.
Oblique aerial view centred on the crofting township and the remains of the buildings, taken from the S.
(NF 8169 5971) An island near the centre of Loch an Aba, called Eilean nan Tighean, is approached over a causeway from the south shore. The island shows traces of an enclosing wall and towards its N end are the remains of a large rectangular erection, 40 by 20ft, to the south of which have also stood two or three minor buildings. Loch an Aba has now dried up, leaving Eilean nan Tighean in an area of marshland. 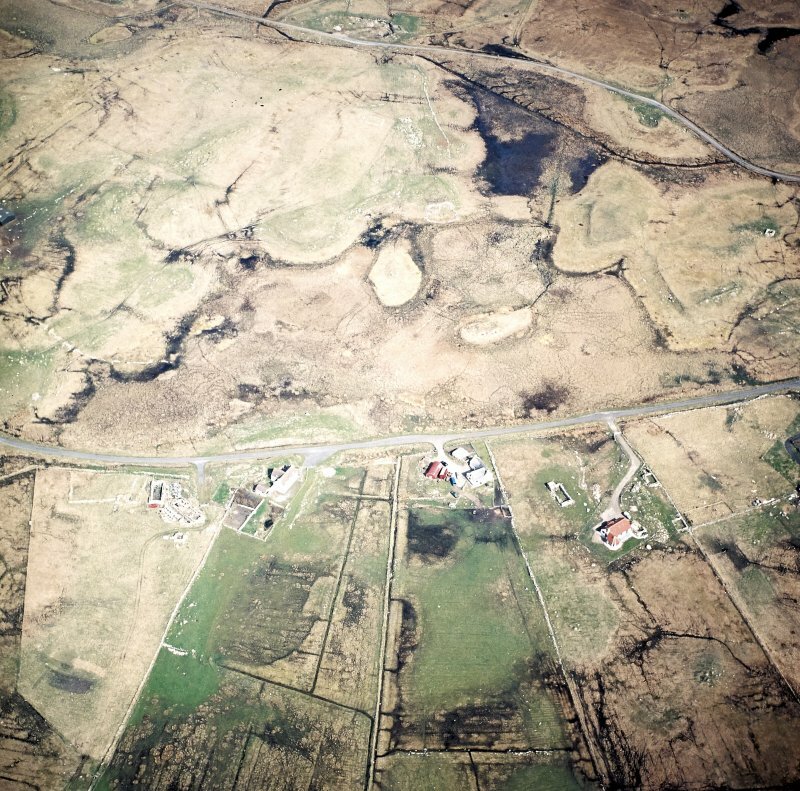 It is approached by a causeway c. 30.0m long, from the east side, at the west end of which are traces of a wall running N and S. Further traces of walling can be seen along the south and west sides of the island. The rectangular building described by Beveridge has rounded corners and measures 13.0m NW to SE by 5.0m transversely, with grass-covered walls 0.7m high and 1.4m wide. The entrance is in the NE wall, on the NW side of which has been built a small internal sub-circular structure. No trace of any minor buildings could be found to the SE of the building, but the ground here is much disturbed, containing many amorphous mounds forming no definite pattern. Visited by OS (R B) 17 June 1965.